Download "Ryan White Program Services Definitions"
1 Ryan White Program Services Definitions CORE SERVICES Service categories: a. Outpatient/Ambulatory medical care (health services) is the provision of professional diagnostic and therapeutic services rendered by a physician, physician's assistant, clinical nurse specialist, or nurse practitioner in an outpatient setting. Settings include clinics, medical offices, and mobile vans where clients generally do not stay overnight. Emergency room services are not outpatient settings. Services includes diagnostic testing, early intervention and risk assessment, preventive care and screening, practitioner examination, medical history taking, diagnosis and treatment of common physical and mental conditions, prescribing and managing medication therapy, education and counseling on health issues, well-baby care, continuing care and management of chronic conditions, and referral to and provision of specialty care (includes all medical subspecialties). Primary medical care for the treatment of HIV infection includes the provision of care that is consistent with the Public Health Service s guidelines. Such care must include access to antiretroviral and other drug therapies, including prophylaxis and treatment of opportunistic infections and combination antiretroviral therapies. 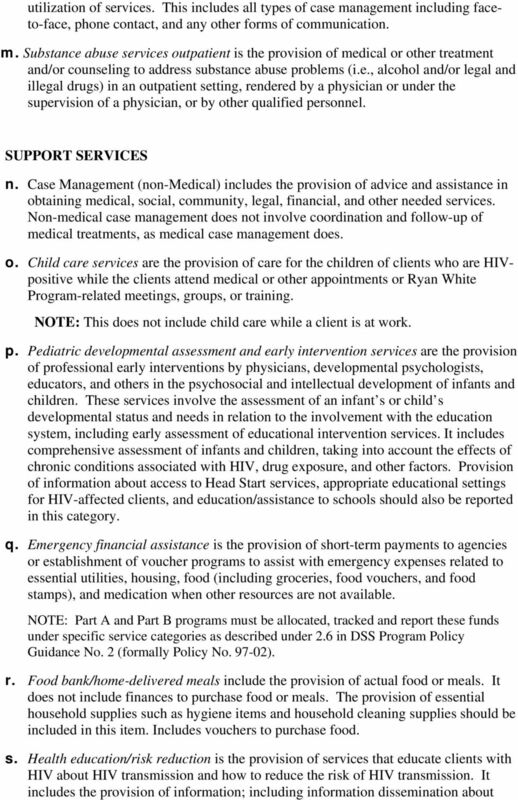 NOTE: Early Intervention Services provided by Ryan White Part C and Part D Programs should be included here under Outpatient/ Ambulatory medical care. b. AIDS Drug Assistance Program (ADAP treatments) is a State-administered program authorized under Part B of the Ryan White Program that provides FDAapproved medications to low-income individuals with HIV disease who have limited or no coverage from private insurance, Medicaid, or Medicare. 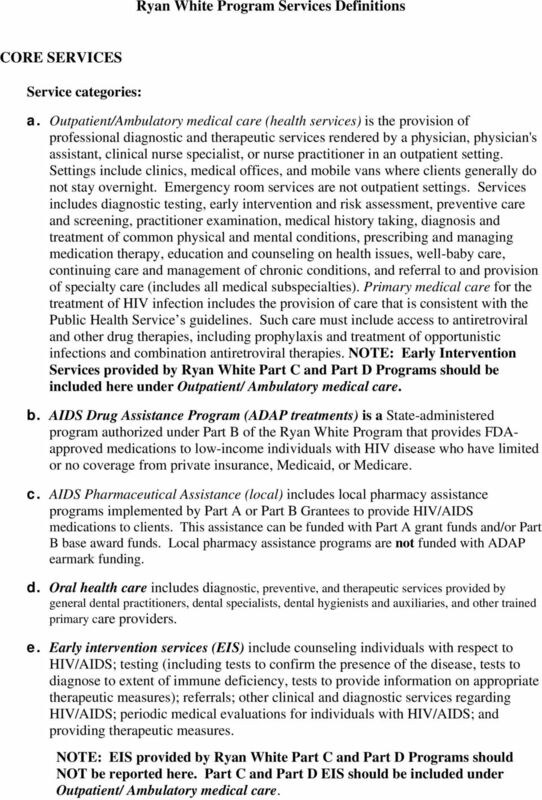 c. AIDS Pharmaceutical Assistance (local) includes local pharmacy assistance programs implemented by Part A or Part B Grantees to provide HIV/AIDS medications to clients. This assistance can be funded with Part A grant funds and/or Part B base award funds. Local pharmacy assistance programs are not funded with ADAP earmark funding. d. Oral health care includes diagnostic, preventive, and therapeutic services provided by general dental practitioners, dental specialists, dental hygienists and auxiliaries, and other trained primary care providers. e. Early intervention services (EIS) include counseling individuals with respect to HIV/AIDS; testing (including tests to confirm the presence of the disease, tests to diagnose to extent of immune deficiency, tests to provide information on appropriate therapeutic measures); referrals; other clinical and diagnostic services regarding HIV/AIDS; periodic medical evaluations for individuals with HIV/AIDS; and providing therapeutic measures. NOTE: EIS provided by Ryan White Part C and Part D Programs should NOT be reported here. Part C and Part D EIS should be included under Outpatient/ Ambulatory medical care. 4 medical and psychosocial support services and counseling to help clients with HIV improve their health status. t. Housing services are the provision of short-term assistance to support emergency, temporary or transitional housing to enable an individual or family to gain or maintain medical care. Housing-related referral services include assessment, search, placement, advocacy, and the fees associated with them. Eligible housing can include both housing that does not provide direct medical or supportive services and housing that provides some type of medical or supportive services such as residential mental health services, foster care, or assisted living residential services. u. 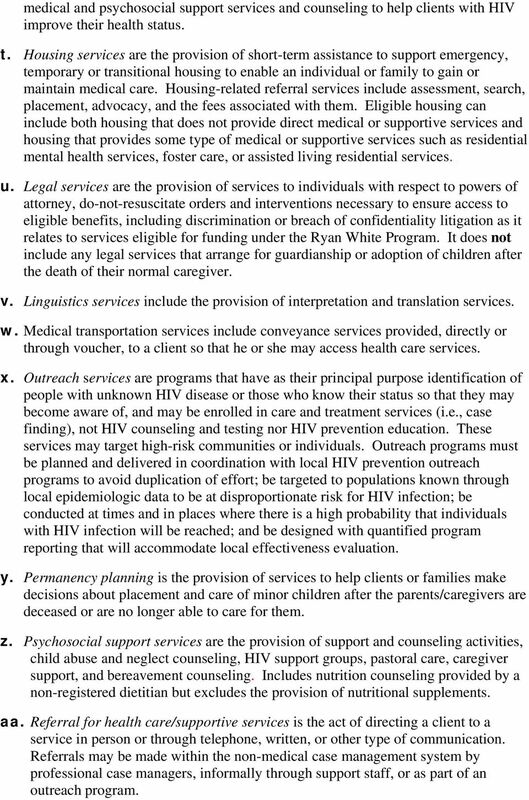 Legal services are the provision of services to individuals with respect to powers of attorney, do-not-resuscitate orders and interventions necessary to ensure access to eligible benefits, including discrimination or breach of confidentiality litigation as it relates to services eligible for funding under the Ryan White Program. It does not include any legal services that arrange for guardianship or adoption of children after the death of their normal caregiver. v. Linguistics services include the provision of interpretation and translation services. w. Medical transportation services include conveyance services provided, directly or through voucher, to a client so that he or she may access health care services. x. Outreach services are programs that have as their principal purpose identification of people with unknown HIV disease or those who know their status so that they may become aware of, and may be enrolled in care and treatment services (i.e., case finding), not HIV counseling and testing nor HIV prevention education. 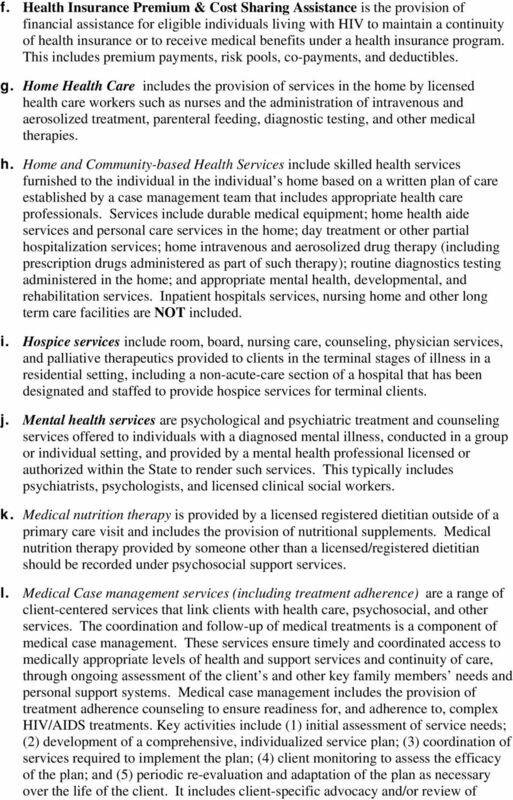 These services may target high-risk communities or individuals. Outreach programs must be planned and delivered in coordination with local HIV prevention outreach programs to avoid duplication of effort; be targeted to populations known through local epidemiologic data to be at disproportionate risk for HIV infection; be conducted at times and in places where there is a high probability that individuals with HIV infection will be reached; and be designed with quantified program reporting that will accommodate local effectiveness evaluation. y. Permanency planning is the provision of services to help clients or families make decisions about placement and care of minor children after the parents/caregivers are deceased or are no longer able to care for them. z. Psychosocial support services are the provision of support and counseling activities, child abuse and neglect counseling, HIV support groups, pastoral care, caregiver support, and bereavement counseling. Includes nutrition counseling provided by a non-registered dietitian but excludes the provision of nutritional supplements. aa. Referral for health care/supportive services is the act of directing a client to a service in person or through telephone, written, or other type of communication. Referrals may be made within the non-medical case management system by professional case managers, informally through support staff, or as part of an outreach program. 5 ab. Rehabilitation services are services provided by a licensed or authorized professional in accordance with an individualized plan of care intended to improve or maintain a client s quality of life and optimal capacity for self-care. Services include physical and occupational therapy, speech pathology, and low-vision training. ac. Respite care is the provision of community or home-based, non-medical assistance designed to relieve the primary caregiver responsible for providing day-to-day care of a client with HIV/AIDS. ad. Treatment adherence counseling is the provision of counseling or special programs to ensure readiness for, and adherence to, complex HIV/AIDS treatments by nonmedical personnel outside of the medical case management and clinical setting. The Agency is responsible to provide and invoice for each contracted service based on the specific service definitions. HOSPICE SERVICES. This document is subject to change. Please check our web site for updates. PUBLIC BENEFITS. What are disability benefits? How is disability determined for SSDI and SSI? NC Health Choice. Publication date: September 1999 OVERVIEW. What is it? Summary of Benefits Effective January 1, 2014 through December 31, 2014 The benefit information provided is a brief summary, not a complete description of benefits. For more information contact the plan.